DX stations help keep cruise ship lecturers informed on the beauties of their island homes. Lecturing onboard cruise ships with my husband John, AE7P, gives us wonderful opportunities to travel to exotic places around the world. It also affords us the chance to meet ham radio operators we have spoken to over the years. Since retiring from teaching, we have worked on cruise ships as professional destination lecturers. We have taken over 40 different cruises so far. Prior to departure on a cruise, we spend months in preparation researching the local areas and history of the ports-of-call and developing PowerPoint presentations for the ships’ guests. I also try to contact ham radio operators, to gain first-hand information about their countries. We have discovered that hams are extremely knowledgeable and are eager to send us local information. We have contacted some via ham radio and the more recent contacts have been by e-mail. We have contacted hams in other areas of the world prior to our travels. Some of these hams we have met in person. Before our first trip to England, we had a number of contacts with an amateur living near London who invited us to visit when we arrived in the United Kingdom. He and his family cordially hosted a delightful few days’ visit as we started our European trip. When we were preparing for a South Pacific cruise a few years ago, we checked our itinerary and were pleased to find that we would be stopping at Pitcairn Island, a remote speck in the middle of the Pacific, hundreds of miles from any other inhabited island. Having read the classic book Mutiny on the Bounty, we wanted to add local information to one of our lectures. Recalling our early years of DXing, in the 1970s, we remembered working Tom Christian, VR6TC, a direct descendant of Fletcher Christian, of Mutiny fame. We wanted first-hand knowledge of his ancestors so we found his e-mail address on QRZ.com. 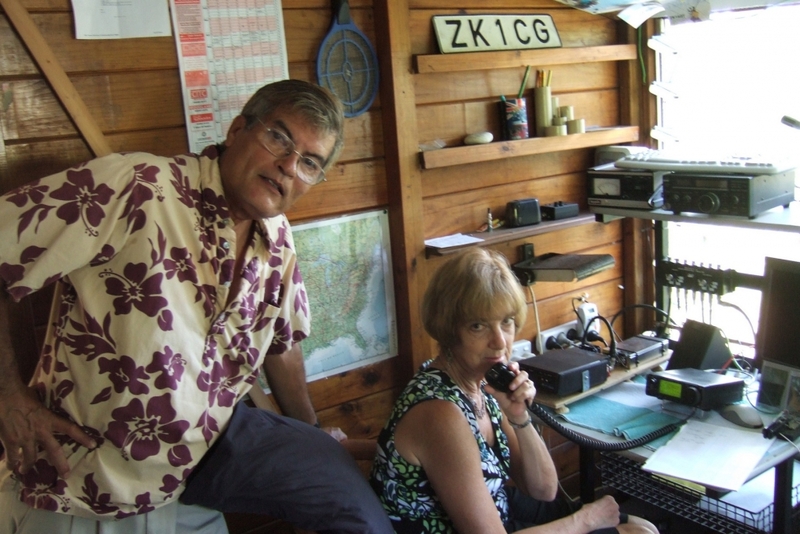 I e-mailed Tom and his wife Betty, VP6YL, and was pleased to get a response saying they would definitely like to meet with us when we arrived at Pitcairn. We continued to correspond and obtained useful information about Pitcairn prior to our departure, asking them if there was anything we could bring them from the United States. Betty replied that Pitcairn could use some vegetable seeds, as they had lost the ones that they had purchased when traveling to New Zealand. We bought all of the seed packets they requested and added in some other varieties of flowers and vegetables we thought might do well in their tropical climate. We packed these items in our suitcase for the flight to New Zealand where our cruise embarked. We were able to clear most of the seeds through customs without any difficulty. When we arrived at Pitcairn, we knew that there would be no port facilities on the island. Consequently, the Pitcairners, numbering only about 50 at that time, launched their longboats and came out to spend the day on our small cruise ship. We were so delighted to finally meet Tom and Betty and they were excited to meet us and to receive the seeds. They brought us a huge basket of fresh tropical fruit grown on Pitcairn and we shared these delicious delicacies with many of the guests on board. Another stop on our South Pacific cruise took us to the lovely island of Rarotonga in the South Cook Islands. On that cruise, we had spent a wonderful day there and promised ourselves that we would someday return for a longer vacation to this Polynesian paradise. In November, 2009 we decided to revisit this island. We made plans to fly there for a week’s stay. 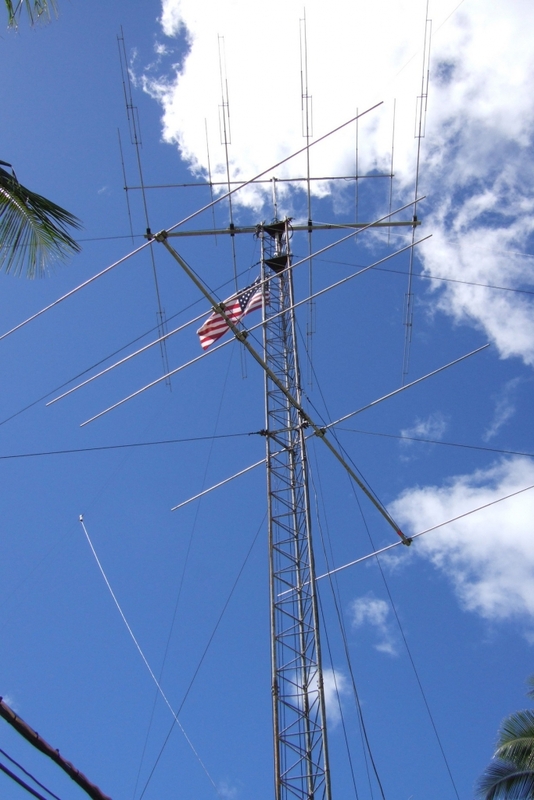 A month or so before departing, I began researching the ham radio operators residing on Rarotonga. We had worked a ham on this remote island many years back but were unable to find him listed as a current resident. Happily, we were able to locate another ham listed in the Cooks, Victor Rivera, E51CG. We e-mailed back and forth for many weeks and then arranged some contacts on 20 meters. Even though his antenna array is far superior to ours it was difficult to hear each other, but we did make some weak contacts. 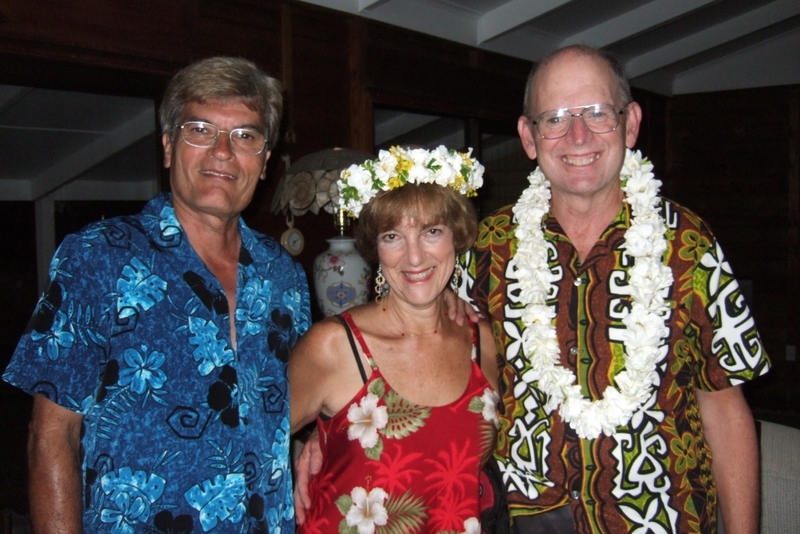 We learned Victor had moved to the Cook Islands years ago from the United States and had lived in our own state of Washington. He enjoyed our e-mails and inquired about Seattle and wanted to know how the area had changed. We quickly became good friends. We asked Victor to let us know what he and his wife, Eleanor, might like us to bring them. We were able to find most of the items and packed one suitcase with those things for them and their friends. The items Victor most appreciated were surprises to us. Knowing how difficult mail service is to the Cooks, we figured he would enjoy reading a Ham Radio Outlet catalog, a collection of current QST magazines and a local edition of the Sunday Seattle Times. 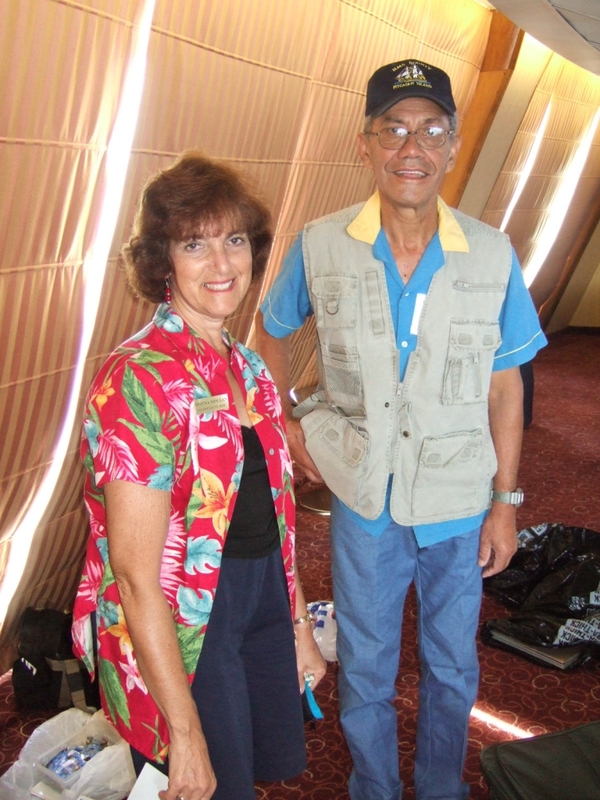 Arriving in Rarotonga, early in the morning, we were pleasantly surprised to have Victor and Eleanor meet us at the airport. They brought along a ham friend and his wife who were visiting from New Zealand. Victor and Eleanor presented us with beautiful leis and invited us to join them at their home once we were settled into our hotel. Their hospitality was wonderful throughout the week. They generously insisted on acting as our guides, showing us Rarotonga and introducing us to the friendly islanders. There are only two hams currently operating on Rarotonga, so Victor encouraged us to operate from his station. Since we were there for a brief vacation, we did not want to take too much of our time operating. He was especially eager to have a woman operate from his shack, as women hams from the Cooks are rare. I said that I would be pleased to operate for a few hours. I learned that it would be necessary for me to obtain a Cook Islands ham license. I was curious as to what kind of written test I might be required to take so I felt a bit apprehensive. At the government office, I was asked what call sign I would like to have. I chose my own suffix. After simply paying the required fee, with no test, I was issued E51FDE. That afternoon, I made a number of contacts with my newly issued license. The conditions were not good but the E51 call and my feminine voice seemed to open the bands a bit to the north and east. I worked quite a number of North and South Americans on both 20 and 15 meters. As we left we surprised Victor when we presented him with our dual-band ICOM handheld transceiver. After a wonderful week visiting with our new friends, we reluctantly flew home and found a number of QSL cards from my Rarotonga contacts awaiting us. I printed a card with my new call and mailed these to the hams, many of whom wrote that I was their first contact with the South Cooks. Through our travels, we have gained new friends and wonderful information to share with the guests on the cruises. We will continue to contact hams prior to future trips and hope to have many more visits as we travel. We have found that it is a wonderful opportunity for us to combine our profession as cruise ship lecturers with our enjoyable hobby of Amateur Radio. Photos courtesy Donna Mollan, WB7FDE. 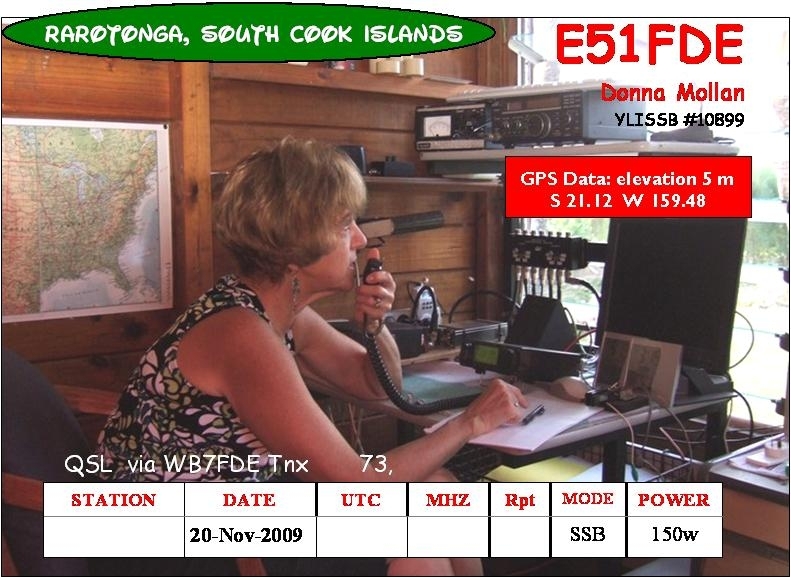 Donna Mollan, WB7FDE, an ARRL member, is a lifelong resident of Anderson Island, Washington and has been licensed since 1976. She and her husband, John, operate on a variety of HF and VHF bands. 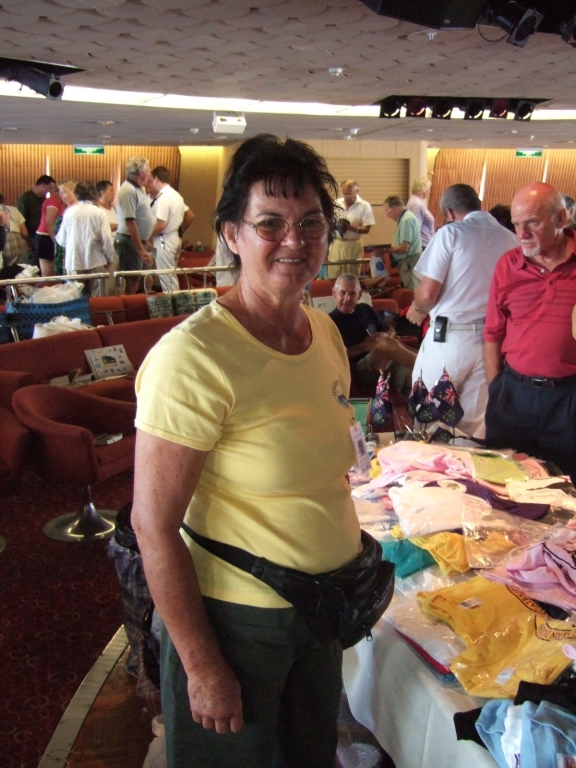 Donna has earned various awards including 5 Band WAS and DXCC and enjoys contests and Field Day operations. Along with her lecturing on cruise ships, Donna teaches a number of university level courses and is a published writer for a number of magazines. She can be reached at 10901 Madrona Dr, Anderson Island, WA 98303.